Book Jacket: "Pema Chodron is treasured around the world for her unique ability to transmit teachings and practices that bring peace, understanding, and compassion into our lives. With How to Meditate, the American-born Tibetan nun presents her first book exploring in depth what she considers the essentials for a lifelong practice. When we look for a meditation teacher, we want someone who has an intimate knowledge of the path. That's why so many have turned to Pema Chödrön, whose gentle yet straightforward guidance has been a lifesaver for both first-time and experienced meditators. With How to Meditate, the American-born Tibetan Buddhist nun presents her first book that explores in-depth what she considers the essentials for an evolving practice that helps you live in a wholehearted way. 'I feel that the ultimate reason why we practice is so that we can become completely loving people. And this is what the world needs," writes Pema Chodron. How to Meditate is a long-overdue book from this wise teacher to assist each one of us in this virtuous goal." Taryn's Review: Meditation has been on my mind lately. It's a practice that I'm curious to know more about and incorporate it into my own life. While the internet is filled with resources, the internet is also one continual distraction, so I felt like a book would be the best medium for me to explore the topic. I saw this book on the library shelf and chuckled...what a straightforward title! I appreciate a book that gets to the point, so into my bag it went. This book really helped me understand what meditation is and can be. 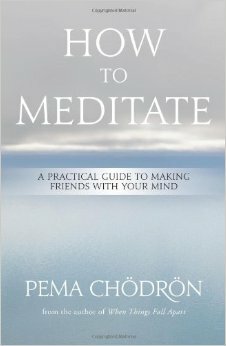 I had some preconceived ideas about what meditation was that the book cleared up for me. The chapters are very short, which was helpful on nights when I was exhausted and not the most clear-minded. I think this book was especially note-worthy in Chodron's explanation that meditation won't be the same each time and there are some days when it just won't happen. I always envisioned that great meditators could zone out anywhere and center themselves, but Chodron reassured me that that isn't always the case, even for the most practiced of meditators. My favorite part of the book was her discussion on really feeling those feelings that pop up in meditation and in life. It is easy to push those feelings down and ignore them, but if they keep resurfacing they are worth exploring, even the uncomfortable ones. Some thoughts that pop up in meditation can easily pass by and that is okay if they do, but it's important to be mindful of certain thoughts that may need extra attention. This would be a great book to purchase and re-read, especially the section on the Seven Delights and how to navigate obstacles. That section was really insightful and helped me recognize my own ego and how it actively plays into my actions and reactions. It took me a little longer to read the book because, while it was engaging, something about it wasn't always enticing to me but it's hard for me to put my finger on why. I'll try a re-read again in the future, but it's definitely a great book for those interested in the subject. I hope to add it to my own bookshelf as a reference guide for my meditation journey.